To prepare the tempura batter, combine the flours and sea salt in a small mixing bowl. Combine the kuzu and water in a measuring cup, mixing until the kuzu dissolves. Whisk the dry and liquid ingredients together until most of the lumps have dissolved. Place the batter in the freezer for 10 to 15 minutes. Cold batter results in crispier tempura. Heat the oil in a heavy deep frying pot. When the oil is hot, dip 5 to 7 pieces of vegetables into the batter completely coating them. Place the batter coated vegetables into the hot oil and deep fry until golden and crispy on each side. Make sure not to deep fry too many pieces at one time, as this lowers the temperature of the oil and results in soggy tempura. Remove with a slotted spoon or oil skimmer and drain on paper towels. 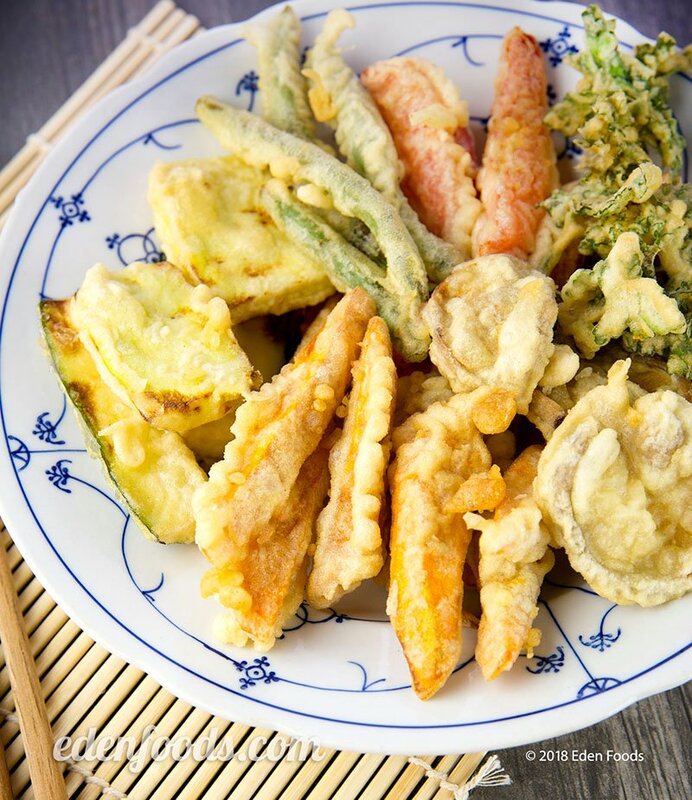 To keep the tempura warm while the rest of the vegetables are being fried, place on a paper towel lined tray in a 200° oven. Continue until all vegetables are deep-fried. Combine the 1 cup boiling water, shoyu and ginger or daikon. Mix and place in small dipping bowls. Dip one piece of tempura at a time in the dip sauce before eating. NOTE: Kuzu makes the batter crispy in much the same way as egg, which is used in traditional tempura batter. The ginger or daikon dip sauce aids in the digestion of oil.